The negative size is 10x12mm on 16mm un-perforated film giving 14 exposures. The film cartridge is similar to the Mamiya with the take up spool having a crossed slot and the feed cartridge is plain. Fixed 35mm (f8.0, f11,f22) lens giving it an equivalent of 85mm lens in the full-framed 35mm format. Range of 0.9m (3 feet) to infinity. Viewfinder has black line for framing short distances (within 1.2m - 4ft). 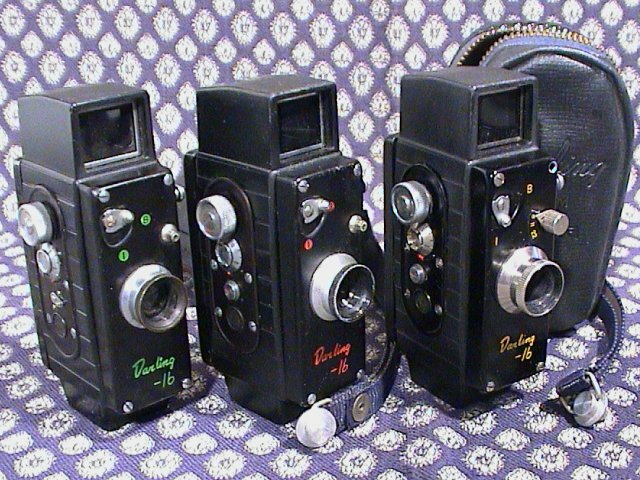 The Darling only had two speeds, B and I (1/50), similar to many other subminiature cameras of this period. The later model added flash synchronisation, moving the aperture selection to the lens. It was sold as an outfit comprising of a camera, flash, close up attachment and developing tank. It was only available in a black bakelite body but green, red and yellow lettering have been seen. There are also variations in the dials on the side of the camera. A variations was made with "Albert Fifth Avenue New York" on the front plate.